Like a lot of good things in life, it all started with a motorcycle. An obsession with motorcycles and motorcycle gear morphed into the launch of Joe Rocket in 1994, manufacturing quality motorcycle jackets. Joe Rocket's "Phoenix" nylon jacket sold a hundred thousand pieces because the perforated, fully armored jacket was the first to provide serious hot weather protection and keep the rider cool. Then after sponsoring 17-year-old Nicky Hayden, Joe Rocket became etched in motorcycle racing culture. Joe Rocket went on to expand its motorcycle gear to include helmets, pants, luggage, boots, and gloves - all designed ahead of the curve of protective motorcycle apparel. MENS METEOR FX BOOT. Split-grain leather construction. DryTech waterproof membrane. Double stitched construction. Internally reinforced ankle, toe and heel. Rubber gear shift protector. 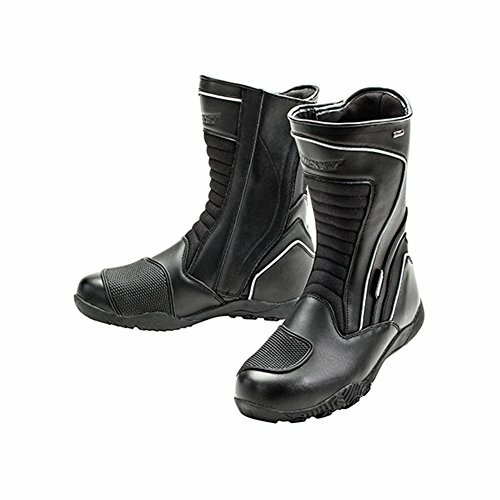 Front and back Heavy Duty waterproof textile Full-Flex ankle articulation. Low profile toe-box for added mobility. Large entry full length zipper with zipper cover. Padded upper cuff. Non-slip aggressive sole. 360-degree Reflective striping.